Retaining walls are built to last, so getting rid of one is labor intensive. The safest approach is to remove the wall one layer at a time to prevent it from collapsing. If the wall is built with mortared stones or bricks, removing them will be difficult to do without damaging the materials. Check that the wall isn't needed to support other structures and expect the demolition to take a full day or two. 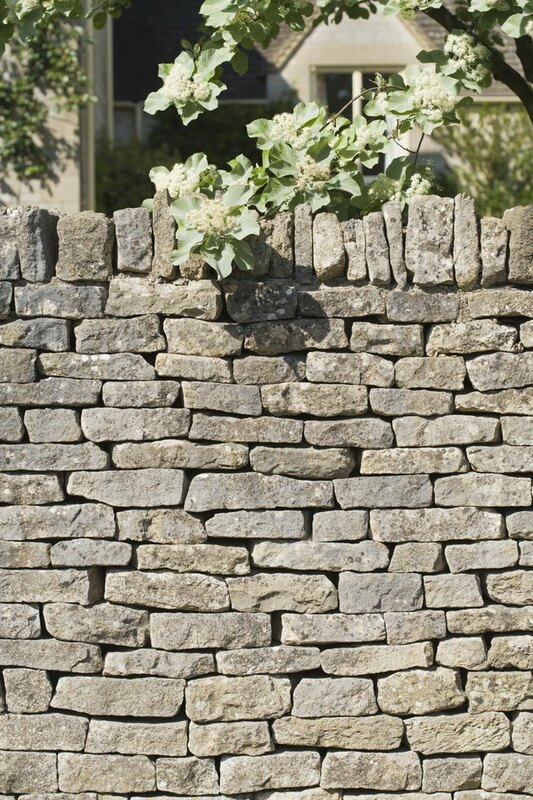 Remove a stone wall from the top down to prevent it from collapsing. Prepare the site and surrounding area by covering any electrical outlets and plants with a plastic tarp. If the soil the wall is retaining appears unstable or the wall is more than 4 feet tall, consider calling a professional to remove the wall for you. In some municipalities, walls that are more than 4 feet tall require a building permit to ensure the wall's structural integrity. During demolition, taller walls present more risk of injury because the materials fall from greater heights. Start at one end of the wall and use a pry bar to try and lift off the top course of stones or blocks. Stand behind the wall, so you're above the stones that you're removing, to prevent pieces of the wall from falling on you. If wall caps were used over the top, wedge a thin chisel under the caps and hit the other end with a hammer to cut through the bead of adhesive and pry the cap up. Dump the top layer of blocks in a dumpster or on top of a plastic tarp if you plan to reuse them. Continue to pry or cut off the blocks, stones or bricks from the top layer down. If the wall is concrete and there are no power lines running through it, work across the length of the wall to create deep cracks in it with a demolition hammer. Then break fallen chunks into pieces with a sledgehammer. Shovel the debris into the dumpster as you work. Throw any rebar or lawn spikes into a bucket. After prying out the bottom course, dig out the gravel foundation with a shovel and dump it in another bucket to reuse in other projects. Fill in the remaining trench with some of the soil from the slope or leave it open if you intend to build a new wall. Call a waste disposal company to collect unwanted debris after you are finished.